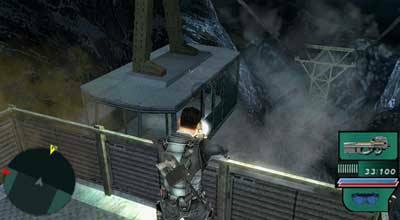 After a very successful initial run on the PS2, Syphon Filter and Gabe Logan make their way onto the portable PSP system. I was really wondering how this game would fare after the hits taken on the series in the subsequent sequels on PS2. I am pleased to say that this game is fantastic, and possibly one of the best on the handheld thus far. As with previous games in the series, you as Gabe take over when the situation gets too much for regular troops or there is a need for deniability. As a result there is high risk missions where your arsenal of cool gadgets and weaponry will come into play in a very handy and innovative way. In this particular title, there have been a number of terrorist attacks on chemical plants that call Gabe into action from the secluded base he has been at in Alaska. As the plot thickens, with more and more twists as we go along, we discover even more treachery is afoot, setting the pace for an explosive game. Graphically this game is extremely impressive with tons of detail and well animated cutscenes that propel the story along nicely. There has been a lot of thought put into scripting this so even though the drama is high, you can really get into it and feel as though you are a part of the action. The controls are intuitive and make sense. There is only really a short period of time in which you will master the controls and then be able to wreak havoc. The neat thing you will notice as you get to use these weapons is that they appear on Gabe’s body as you get them until he is one well-equipped mofo. The detail in the game environments is lush and even the character models have been given the once over so that clothing and equipment looks as good as possible. Even projectiles have not been overlooked in the game with some excellent particle element work being put into explosives and other environmental effects such as smoke. 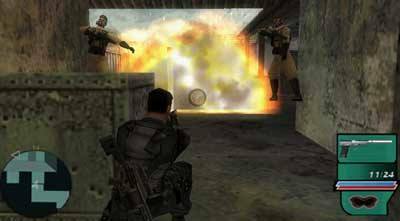 The gaming environment will also react in some instances to your weaponry with barrels blowing up and other flammable devices ready to help you out against the bad guys. It’s just a really well put together title that players are going to get a real blast out of in both single player and multiplayer modes that are available. I do think that this game is one of the first that shows the real potential of a handheld to provide an enthralling experience in this genre. Don’t get me wrong, there are other titles that are a ton of fun too, however in terms of “serious” games, Dark Mirror has it nailed.